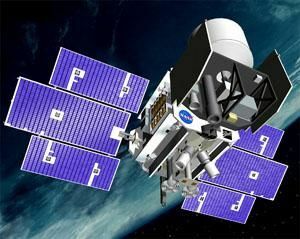 American earth land resources satellite. One launch, 2003.01.13. 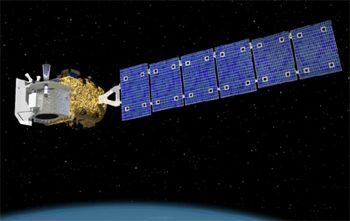 Laser Altimetry Mission satellite built by Ball Aerospace for NASA, USA. Launched 2003. Used the BCP-2000 bus. Status: Operational 2003. First Launch: 2003-01-13. Last Launch: 2003-01-13. Number: 1 . Gross mass: 970 kg (2,130 lb). ICESat (Ice, Cloud, and land Elevation Satellite) was the benchmark Earth Observing System mission for measuring ice sheet mass balance, cloud and aerosol heights, as well as land topography and vegetation characteristics. The ICESat mission was to provide multi-year elevation data needed to determine ice sheet mass balance as well as cloud property information, especially for stratospheric clouds common over polar areas. It was also to provide topography and vegetation data around the globe, in addition to the polar-specific coverage over the Greenland and Antarctic ice sheets. NASA selected Ball Aerospace to adapt its Ball Commercial Platform 2000 (BCP 2000) spacecraft bus for the laser altimetry mission. The entire satellite was assembled at Ball facilities in Boulder, Colo., and was controlled on-orbit by the University of Colorado. Originally designed to accommodate high-resolution cameras that acquire half-meter class imagery, the spacecraft was well suited to the ICESat precision pointing control and knowledge requirements, and also could rapidly orient toward any point within 5 degrees of the ground track. The spacecraft provided 350 W orbit averaged payload power. A redundant Solid State Recorder provided 56 Gb of payload data storage, or 24 hours of science data. The payload data was downlinked through a 40 Mbps X-band transmitter which allowed 4 hours of data dump within a typical station pass. The spacecraft was a fully redundant design that provided a probability of success of >86% for a 5-year mission life. The spacecraft bus and payload were powered by two single-axis articulated solar array wings, consisting of three winglets each. Two star trackers provided precision pointing and stability. A fixed X-band antenna was mounted on a post to provide a high bandwidth downlink. Spacecraft command and telemetry uplink/downlink on S-band frequency allowed for simultaneous command and telemetry operation. The attitude control and determination subsystem was designed to allow payload operation from any orientation, and provided rapid slewing, tracking of targets, and minimizes vibrations and induced jitter. Two BlackJack GPS receivers from NASA's Jet Propulsion Laboratory provided precision orbit determination, timing and geolocation. A hydrazine propulsion system corrected for any launch insertion errors, and maintained the correct orbit for ground track repeatability. ICESat was placed into a 94 degree inclination so each successive ground track would precess to the West as the Earth rotated, at an initial altitude 590 km above the Earth. ICESat's designed lifetime was for three years of operation with a five-year goal. The primary instrument was the GLAS (the Geoscience Laser Altimeter System). GLAS was the first laser-ranging (lidar) instrument for continuous global observations of Earth, which would make unique atmospheric observations as an important component of the ESE climate change program. GLAS was a facility instrument designed to measure ice-sheet topography and associated temporal changes, cloud and atmospheric properties, and provided information on the height and thickness of radiatively important cloud layers which was needed for accurate short term climate and weather prediction. In addition, operation of GLAS over land and water provided along-track topography. GLAS included a laser system to measure distance, a Global Positioning System (GPS) receiver, and a star-tracker attitude determination system. The laser transmitted short pulses (4 nano seconds) of infrared light (1064 nanometers wavelength) and visible green light (532 nanometers). Photons reflected back to the spacecraft from the surface of the Earth and from the atmosphere, including the inside of clouds, were collected in a 1 meter diameter telescope. Laser pulses at 40 times per second illuminated spots (footprints) 70 meters in diameter, spaced at 170-meter intervals along the Earth's surface. Family: Earth, Earth land resource sat. Country: USA. Launch Vehicles: Delta, Delta 2 7000, Delta 7320-10. Launch Sites: Vandenberg, Vandenberg SLC2W. Bibliography: 2, 3807, 3808, 3809, 554, 6584, 12638.